UPM Conveyors has developed a stand-alone mobile system for a leading UK based injection moulder of drinks closures. 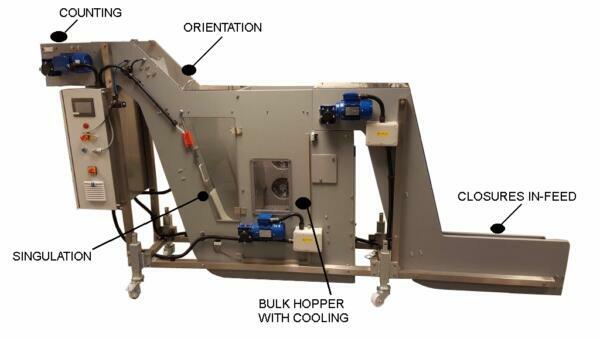 The system is to transfer closures to a bulk feed hopper for cooling, singulation, orientation, and counting prior to presentation to a wadding or sealing machine, or for other post moulding operations. The bulk feed hopper allows for 5 minutes of production at a rate of 130 per minute (60mm diameter x 25mm high closures) to allow for a reel change on the downstream equipment. It includes cooling fans that can incorporate finned coils with chilled water to eliminate any heat distortion prior to singulating and orientating each cap, plus a photo electric sensor for counting. The complete system is mobile so it can be utilised at any production cell as a standalone system or integrated into the moulding machine. Although initially this was a custom engineering special, UPM can now offer this a standard unit for similar applications.